How do you display these things in inline mode (with all the nice inline formatting) as though they were in display mode ? How does one control the size of integral, sum and product symbols? How does one control the placement of the limits of integration, summation, and multiplication: side-set vs. below/above? These two aspects can be addressed separately. To control the size of the operators explicitly, one writes either \textstyle for small symbols or \displaystyle for large symbols, before the command that generates the symbol. Side remark, inspired by an observation by @HaraldHancheOlsen: In addition to influencing the size of the operators created by the commands \sum, \prod, etc, the declarations \textstyle and \displaystyle may also affect the behavior of other subsequent commands in the current math-mode environment. To control the placement of the limits, one writes either \nolimits (for side-set limits) or \limits (for limits set below&above the symbol) after the command that generates the symbol. The possibilities are illustrated in the table below. Note: Setting the options sumlimits and intlimits when loading the amsmath package does not affect the placement of limits when in inline math. \sum, \prod, \coprod, etc: Limits set above and below operator, unless amsmath was loaded with the option nosumlimits. Note: The sumlimits and nosumlimits options (and the commands \limits and \nolimits) affect not only the appearance of summation symbols in display math mode, but also that of \prod,\coprod, \bigcup and \bigcap, etc. 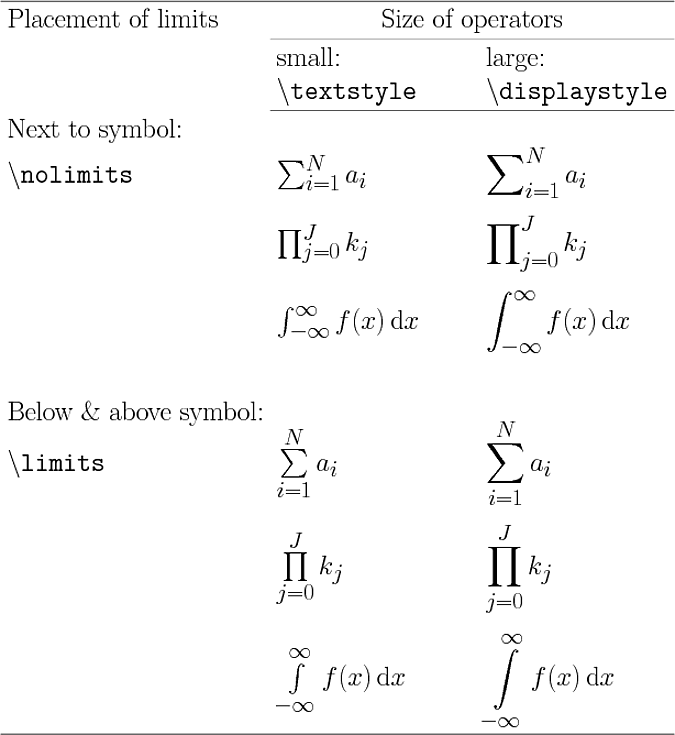 See Tables 57 to 65 of the Comprehensive LaTeX Symbol List for the names of these "large" -- more precisely, "variable-sized" -- math operators. The only group of variable-sized operators that's treated differently is the set of integral symbols (presumably because they're generally already quite a bit taller than the other "large" operators). \int: Limits are set to the side of integral symbol unless amsmath was loaded with the option intlimits. It's generally not a good idea to use the \limits command when in inline math mode. Otherwise, one is virtually assured of wrecking the appearance of the paragraph where the formula appears. It's frequently not even necessary to indicate the full set of limits of a summation or multiplication when in inline math mode. Expressions such as \sum_i or \prod_j are usually just fine. You may even be able to get away with omitting the subscripts i and j! Using the \displaystyle command (to force the creation of large symbols) while in inline math mode is an even worse idea than using \limits. in your preamble, every equation will be typeset in that manner, and you don't have to put \displaystyle in every equation. Of course, if you are looking to change just a few equations, then \displaystyle is easy to use. Good typography relies on the balance of all aspects of black and white on the page. Uniformly spaced lines for the ordinary text make for good legibility. That's why some symbols, that in display are rendered with limits above and below, are set with limits on the side when used in in-line formulas. I too, when I began to use TeX, tried to set limits for sums above and below also in in-line formulas, but I soon realized that it's wrong: two white bands separated that line from the next ones. For that very reason the symbols for summation and integral are set in two different sizes: a smaller one for in-line formulas, a larger one for displayed formulas that don't have spacing constraints. will do less damage to the page, but will nevertheless spoil it. 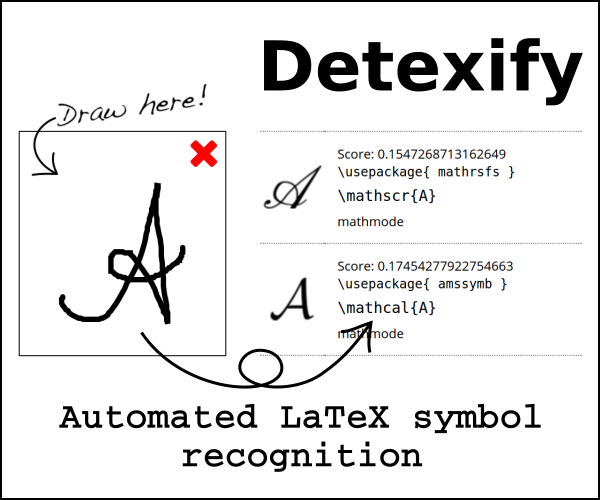 Such constructions have their use, for examples in tables where TeX would use in-line math mode. But I will never suggest to use them in normal text. The solution you seek is to use the \displaystyle command within the inline environment as such. This will give the nice effect of the starting term being underneath the sigma and the maximum value above while keeping the symbols inline. Is there any way to force the equation of text line to fit textwidth? How do I get a light math font?